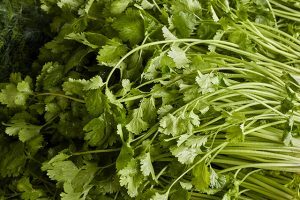 Also called Chinese parsley or cilantro, coriander is an aromatic herb that has a distinct smell. It has lacy, shiny leaves that are soft and thin. It’s widely used as a culinary ingredient and garnish. But more than a staple at the kitchen, coriander contains powerful compounds that help fight various diseases. Coriander is packed with powerful antioxidants that help protect the body from free radical damage. Keeping the cells healthy is one of the key ways to avoid getting ill because oxidative stress can cause DNA cell damage and may lead to the development of cancer cells. Coriander’s anti-cancer properties have been proven by science. Antioxidants present in this green leafy vegetable – beta-carotene, caffeic acid, vitamins C and E, ferulic, quercetin, and kaempferold – can help prevent cancer by getting to the root cause: oxidative stress. Similarly, the antioxidants help protect the eye. The antioxidants prevent eye disorders and reduce the strain on the eyes. With enough intake, you can prevent age-related diseases like macular degeneration. The acids found in coriander – linoleic, palmitic, ascorbic, oleic, and stearic acids – can lower cholesterol levels in the bloodstream. Consequently, you’ll be able to prevent strokes and heart disease. Coriander is also great for people with hypertension as this vegetable contains calcium that reacts with the nervous system’s neurotransmitter to relax the blood vessels. This delicious vegetable can also detoxify the body. Phytic acid, citric acid, and amphoteric electrolytes bind to the heavy metals in the bloodstream and then flushes them out of the system. This process is beneficial in preventing the formation of free radicals and improving digestion. They also detoxify the kidney, eliminating salt from the organs and ensuring that the body doesn’t have poisonous heavy metals like cadmium, lead, and mercury. As a rich source of calcium, coriander contributes to bone health. You can also prevent anemia. The high iron content of coriander can improve cognitive functions and give you an energy boost. Oh, and did you know that coriander is also a good aphrodisiac? Packed with lots of nutrients, coriander makes for a really good addition to your meals. It helps that it’s appetizing and tastes good. But what you should be more thankful for is the fact that it is good for a lot of your organs. Coriander is, surprisingly, good for the skin as well. Its leaves function as a disinfectant. They have antifungal, detoxifying, and antiseptic properties that help clear any skin disorder. Citronelol, the antiseptic compound in coriander, helps cure mouth ulcers and speeds up the healing process. You can also use it as a natural breath freshener. It can also be a natural antihistamine. Coriander has anti-allergic properties that reduce uncomfortable symptoms of allergies and fever. It’s also great for the digestive system. The essential oils present in coriander contain linalool and borneol, both beneficial for preventing diarrhea. These two help improve digestion and maintain proper liver function. No, coriander isn’t just used as a garnish for gourmet meals. There’s plenty of ways to enjoy this. You can include it in scrambled eggs or steak. You can make soups or stews. Here are delicious recipes for coriander that you can use at home. Coriander can give you clearer skin. Coriander can prevent anemia, cancer, stroke, and heart attacks. Coriander helps wounds heal faster. Coriander keeps bones strong and healthy. Coriander is a good detoxifying agent.